There's this Aboriginal thing going on in Candiloro's art -- Dot painting, Bark painting -- I'm thinking symbols: arrows/patterns. This is combined with a sort of Byzantine mosaic reflection, characters are nestled into their environments, two-dimensionally rendered with a denseness, packed within each frame, and yet Candiloro plays with perspective and angles, juxtaposing them into each panel mosaic which lends a surprising sense of space. There is a current of consolidated and compacted energy in his art -- there is an architecture to everything -- and this causes it to almost combust from within. In a Candiloro book, light struggles against dark, or, perhaps, it is the other way around. Regardless, this tension between opposites keeps each page moving both in terms of pacing and emotions. It's churning while flat; it is thick and load-bearing. It fits with his storytelling. In his new books, Candiloro continues spelunking through American pop culture's past and putting his own unique stamp on the rampant devices and cliches he discovers. His attraction/repulsion dichotomy with his subject matter always seems to lead him to larger commentary about media, personality, and human connectedness, and Viddy Well, Brother and Budd & Luu Part 1 continue this exploration. 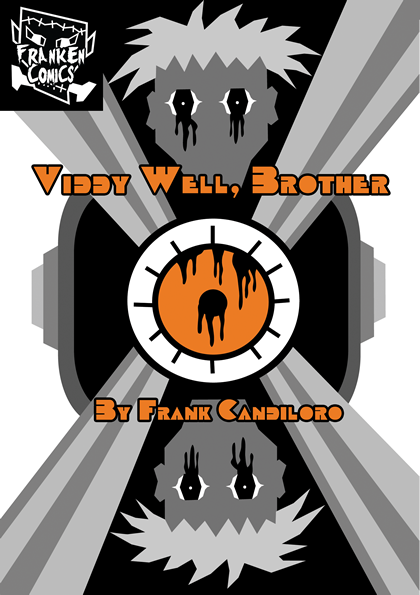 Viddy Well, Brother is Candiloro's homage to Anthony Burgess' A Clockwork Orange and Stanley Kubrick's subsequent film adaptation. In Candiloro's world, the lead character "little malchick Malcolm" also lives in a repressive society, but he has become fascinated with a film called, A Wind-Up Tangerine, "an obsession so strong that he sought out anything to fuel his cine-fetish." What follows is Candiloro riffing on the themes of Burgess' novel, while making a larger commentary on the nature of hero worship, families, sanity, and the abstract notions of morality. Candiloro gets a little lost along the way in this book. His over-reliance on nadsat, the Russian influenced lexicon that Burgess uses in A Clockwork Orange, contributes to this fact just a bit. The other part of this may be that he is adapting an adaptation to adopt new themes while adapting them to the adaptation of the adaptation of the original, if you get my drift. It's heavy lifting, and Candiloro makes his way through with only a couple of stumbles here and there. Budd & Luu Part 1, on the other hand, is an entirely different beast altogether. Here Candiloro goes full meta-jacket, using characters from the old "before-the-movie-serials" to comment on conceptions of entertainment and, more importantly, our sense of reality. Good old Abbott and Costello, here none-to-subtly re-cast as Budd Ahhboot and Luu Cohstelloh, have been living a life of hijinks, adventures, and an on-going conversation about who, exactly, is on first. Suddenly they are "kidnapped" by the Creepers and taken to The Irrenanstalt to be archived and stored in order to … well, I'll let you find out. Needless to say, when Candiloro releases Part 2 of this series, I'll be waiting in line. Budd & Luu Part 1 is Candiloro's best book to date. Here he pours on the wonk and The Irrenanstalt, in particular, provides him with the right canvas to allow the sharp straight lines that make up his art shine. The intricacies of each panel are almost mesmerizing, almost overpowering, and it works perfectly. Here is a comics creator using all the tools in his arsenal to compliment each other. Candiloro's pages have never been this detailed. They are claustrophobic at times and expansive at others, which helps push his narrative to new emotional heights while adding layers to his thematic reconnaissance. I'm a big fan of Candiloro's work already; Budd & Luu Part 1 will make you one too. It's a subtle book which I could spend paragraph after paragraph dissecting. There's a lot going on in Budd & Luu Part 1's 40 pages, from a damn near dissertation on fictitious nature of the constructs of personality, to an interesting commentary on the act of storytelling and the persistence of certain tropes. And this is just Part 1. It has been a pleasure watching Frank Candiloro grow as a comic creator. Each book he produces is just that much better than the last. He is in command of his style. He is in command of his writing. He is a hell of a nice guy and the Australian comics scene, if not the entire comics industry, is all the better thanks to his enthusiasm, work ethic, and talent. And you know what, I bet by the time I finished writing this review Candiloro has already put the finishing touches on a new book. You can check out and purchase all of Frank Candiloro's books at his website.